#FCLMblog | Lokomotiv Mosca Blog: Delvin N'Dinga is set to sign for Lokomotiv. AS Monaco's midfielder Delvin N'Dinga could join Lokomotiv. According to L'Equipe, Lokomotiv has already found an agreement for the Congolese for about 2M. The 27 years old should sign a three-years contract. 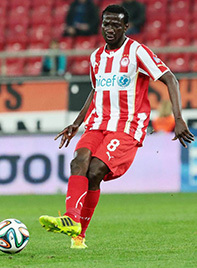 N'Dinga signed for Monaco in 2012, but he spent the last two seasons on loan at Greek side Olympiacos. The transfer should be formalized in the next hours as the player has already had the medicals in Moscow.